Lupus Link | Saint Paul Media, Inc.
Lupus Link Minnesota is dedicated to advancing knowledge and mobilizing resources to improve the lives of Minnesotans and others affected by lupus and related diseases. A new nonprofit, LLMN approached us to create a visual branding system to represent their mission, work, and constituents. Though we were granted a lot of creative freedom overall, LLMN requested that we include the color purple, explore visual representations of the word “link,” and avoid lupus clichés such as butterflies and wolves. It’s no straightforward task to brand an organization as multifaceted as Lupus Link Minnesota, which raises awareness, funds research and provides services to people affected by lupus. We aimed to portray LLMN as welcoming, positive, committed and knowledgeable across all brand touchpoints. In discovery meetings with LLMN staff, we defined their brand voice with the help of lots of coffee, and then it was time to hit the sketchbooks. Digital mockups of some of those sketches are shown below. The final identity system is visually striking, modern, and memorable. Equally important, it has layers of meaning described in the brand guidelines book that we created for the LLMN team. See more about the icon’s meaning below. The icon consists of two cursive lowercase Ls, which form a flowing M below them. Not just a literal representation of the name Lupus Link Minnesota, the Ls create several symbols. The first symbol is two people who are linked. One person represents an individual affected by lupus or a related disease. The other embodies a researcher, medical professional, organization, donor, or another individual affected by the disease. Together, the two Ls form a heart shape. This underscores the idea of support and compassion. They also bring to mind awareness ribbons. 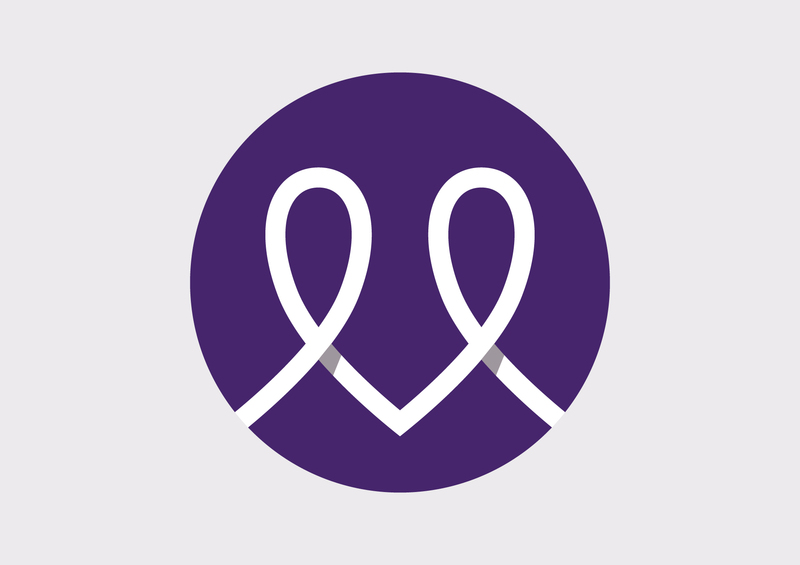 A purple ribbon is commonly worn to show support or raise consciousness for lupus. The shadows on the Ls indicate light shining down. This represents knowledge through research and the hope that this research will lead to the discovery of the cause and cure of lupus. Finally, the circle encompassing the mark represents community, wholeness, and inclusiveness. © 2019 Saint Paul Media, Inc.